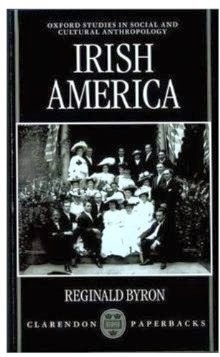 I have recently finished re-reading my copy of Irish America by Reginald Byron (Oxford University Press, 1999). The title may sounds quite broad, but the book is an incredibly detailed anthropological and sociological investigation of the Irish community in Albany, NY. Research for the book consisted of interviews with 500 Americans of Irish descent in the 1990s, many of whom were elderly, and have most probably passed away by now. Extensive interviews were carried out with these residents, including going into detail about their ancestors. A very basic tenant of social science research is that interviewees almost always remain anonymous, but these interviewees were free to talk about their ancestors. My grandfather came from Ireland, by way of England, and landed in Pennsylvania in 1898...He worked in the coalmines. His name was Thomas McCall. After he came up from Pennsylvania he married my grandmother who had been born here. She was Irish...her parents were form Cork and my grandfather was from Clare. My father's parents came from Sligo; what town I don't know. They were married in Sligo. My grandmother's name was Mary Ryan. She was married to John Laverty. He came here first, I'd say about 1875. [Mary Ryan] was taken to the ship twice but the relatives and everybody made such a terrible fuss that she wouldn't come. My grandfather went to the parish priest, I suppose it was St. Joseph's [in Albany], and told him the problem...On my mother's side, my maternal grandfather had studied to be a priest in Ireland, He came from Claremorris in County Mayo. He got into a spot of trouble...He wrote pamphlets in Gaelic and got into trouble over it. The book also goes into macro and micro detail to explain how Irish immigrants ended up in Albany, and how they moved within the city as it developed, contributing to city and religious institutions. 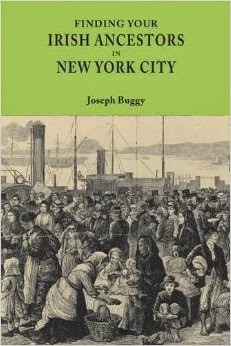 It's a must read if you have Irish ancestors from Albany, NY. A 'Look Inside!' preview is available on Amazon. More broadly, when perusing their ancestors, genealogists often fail to think of engaging with anthropological, sociological, and academic historical research. Of course it does not help that one of the main places to access this output, academic journals, are mostly behind pay walls on institutional subscription databases, such as JSTOR (With JSTOR, you can read three free articles every two weeks). If possible, you should certainly try to search in academic journals for years, locations, and events that are pertinent to your research. Byron, Reginald. Irish America. New York, NY: Oxford University Press. 1999. p. 97. Hendricks county is just to the west of the city of Indianapolis in the state of Indiana. By 1870, the city had grown steadily due to the first railroad, which opened in the 1840s. In the 1870 census, Lincoln township in Hendricks county reported a population of 1,502. 5.25% of those people are listed as born in Ireland, a total of 79. For all 79, their county or place of origin is listed. You can read through the 38 pages of census returns for Lincoln township by clicking here. Browse the pages by using the image number arrow. The U.S. Census Series of articles highlight examples from the federal census that give an Irish county/place of birth.To read about other examples like this click the 'Census Series' label, below. All total numbers and percentages come from a manual tabulation from the relevant census pages. Small errors are quite possible. When you do genealogical research you really should not be surprised at the unusual record collections that Irish people can be found in. One such example is the North-West Territories Métis Scrip Applications found at Library and Archives Canada. Firstly, some background: Throughout the late 19th century, settling the west was paramount for the newly confederated Canada. Clearing the title [rights to land ownership] of the region’s Indigenous peoples was integral to this process. As a means of extinguishing the Aboriginal title of the Métis, the scrip policy was implemented in the North-West, part of which is now Saskatchewan. The Métis were dealt with on an individual basis. Scrip commissioners travelled to Métis communities and held sittings at various locations where Métis gathered to fill out applications for their entitlement. The basic premise to scrip was to extinguish the Aboriginal title of the Métis by awarding a certificate redeemable for land or money – the choice was the applicant’s – of either 160 or 240 acres or dollars, depending on their age and status. Some of these applications, for the years 1886-1906, are available to view online and were collected by an organization with a very un-PC title, North-West Half-Breeds Claims Commissions. This name resulted from the applicants having one parent who was Métis and another who was non-Métis, usually French-Canadian, but sometimes Irish. However, many of the applicants in the collection are listed as having two Métis parents. A change to the eligibility rules on 1885 could have something to do with this. 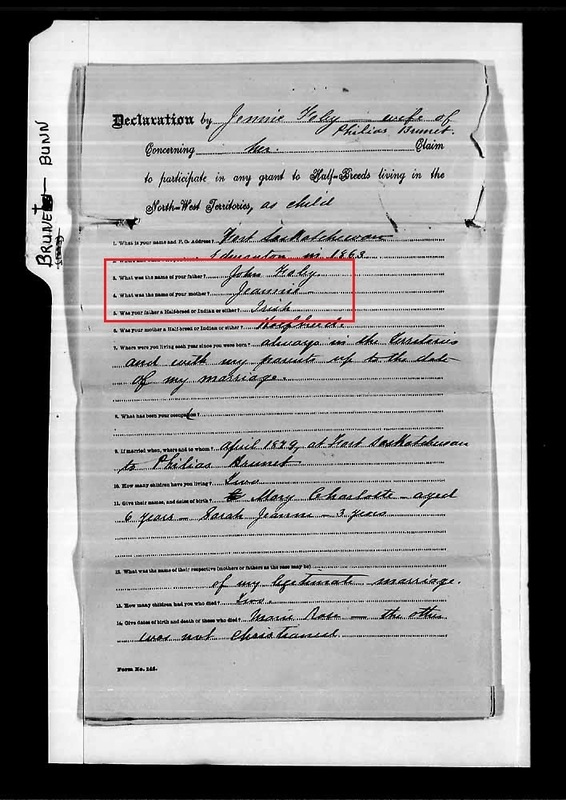 Brunet, Jennie - Concerning her claim as a child - Address, Fort Saskatchewan - Born, Edmonton, 1863 - Father, John Foley, (Irish) - Mother, Jennie, (Métis) - Married, April, 1879 at Fort Saskatchewan to Philias Brunet - Children living, two, Mary Charlotte born 1879 and Sarah Jeanne born 1882 - Children deceased, two, Mary Rose and another not christened - Scrip for 240 acres - Claim 51. Document from Samuel & John Cunningham application. Unfortunately, navigating the Library and Archives Canada website can be quite complex. Start here if you think you have some Irish ancestors who were in Saskatchewan in the later 19th century. Then click "Show Arrangement Structure", followed by the links for "Pages 1.11", "Pages 1.12" etc.. This will open links for each individual application. A Ctrl+F search is the best way to proceed from there, using the word 'Irish" or the name of your ancestor. Library and Archives Canada. 2013. 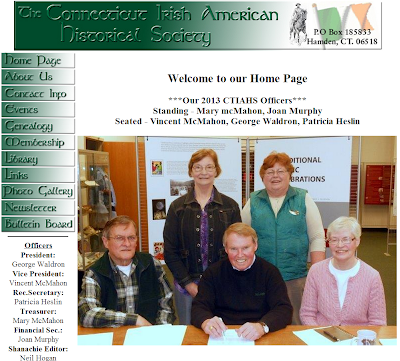 The Connecticut Irish American Historical Society (CTIAHS) was founded in 1988 and is the main ethnic Irish historical and genealogy group in the state. The activities of the groups are wide-ranging and include the publication of a newsletter, a genealogy group, a library/archive, oral history interviews with older members of the community, and participation in festivals and ceremonies. Based in East Haven, just across the Quinnipiac river from New Haven, the group has over 300 members and is involved in pretty much everything to do with Irish heritage in Connecticut. CTIAHS has a dedicated genealogy group that meets once a month. They have published books such as Early New Haven Irish and Their Final Resting Places: The Old Catholic and Saint Bernard Cemeteries and have made a valuable contribution to the study of Irish genealogy in Connecticut. You can learn all about the organization on their website, here. Bohan, Ellen, Patricia Heslin, Paul Keroack, Bernard Singer, Rosanne Singer, eds. with Neil Hogan, Robert O. Larkin, and Jamie Longley. Early New Haven Irish and Their Final Resting Places: The Old Catholic and Saint Bernard Cemeteries. Hamden, CT: Connecticut Irish American Historical Society. 2013. David Rumsey's fantastic map website has many examples of demographic statistics on cartographic beauties. One example I came across is an 1874 creation based on statistics from the 1870 U.S. federal census. For the Irish, the page has two measurements - absolute (number per square mile) and relative (number as a percentage of the whole population) numbers east of the 100th meridian, the line that roughly divides the U.S. in two. You can access the map here. Quite a somber note is struck in this image with people looking forlorn and bereft of happiness. The Emigrant Agent's Office - The Passage Money Paid is dated 10 May 1851, which would have been towards the end of the Famine. Some of the links might not work due to the age of the article but it contains a wealth of information on the topic the author writes about. 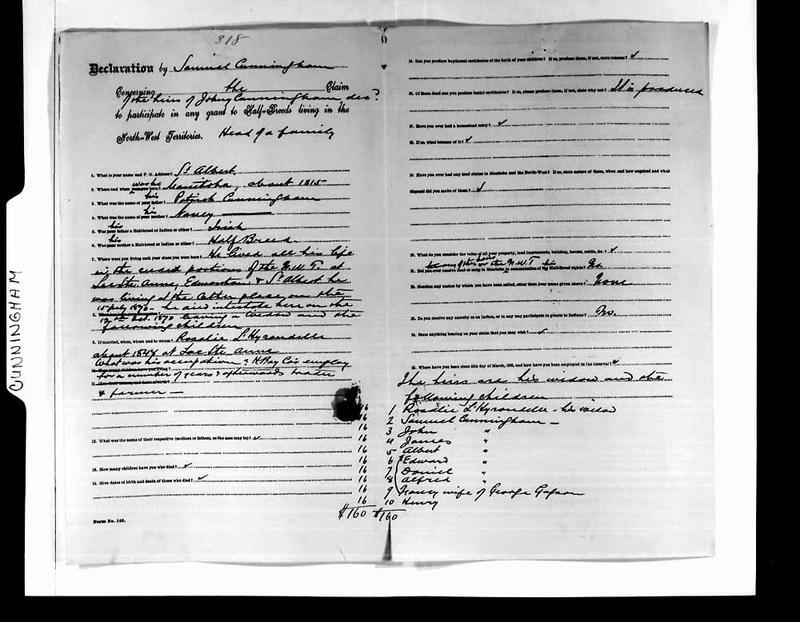 Daly discusses immigration and naturalization records, passenger arrival and departure lists, tombstone inscriptions, newspapers, business records, and other records. 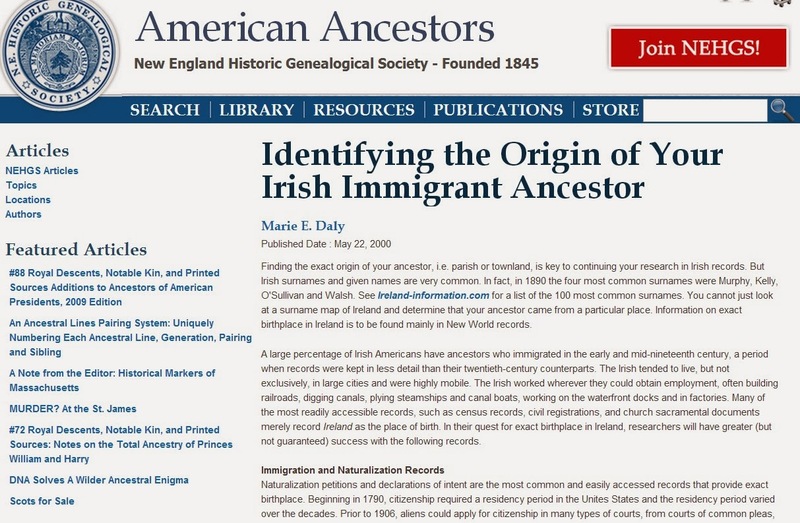 Daly, Marie E. Identifying the Origin of Your Irish Immigrant Ancestor. 22 May 2000. 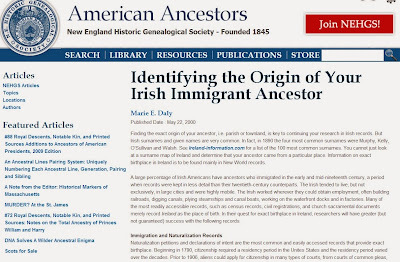 Available online at http://www.americanancestors.org/identifying-origin-your-irish-immigrant-ancestor : accessed 2 January 2014. The February edition of Irish Lives Remembered is now available to read online. 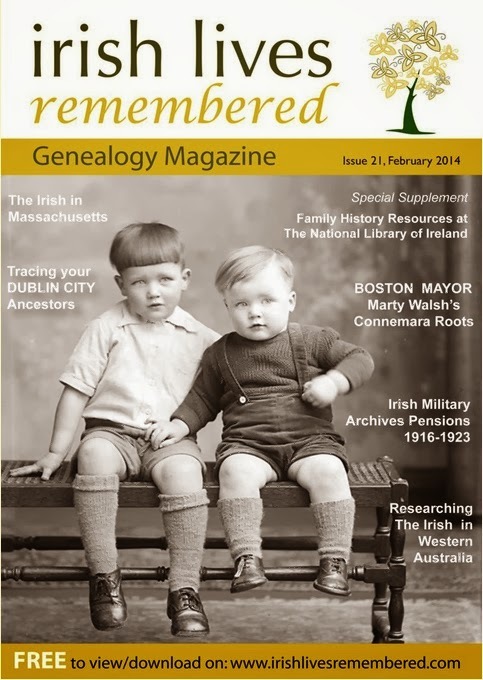 In this months issue I write about sources for Irish genealogical research in the state of Massachusetts. You can access the magazine by clicking here. 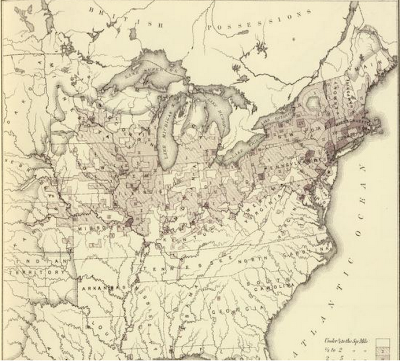 About 2.5 billion people were enumerated in the 16 censuses that were conducted in the United States from 1790 to 1940. One question that has been consistently asked in various formats since 1850 is where people were born. The country (usually as it exited at the time the question was asked) of birth is recorded for those born outside the U.S. However, over the centuries there were census enumerators that went above and beyond what they were asked to do when recording where people were born. For Irish immigrants, this has resulted in their county and sometimes town or place of birth being recorded. Over the coming months I will highlight such examples. 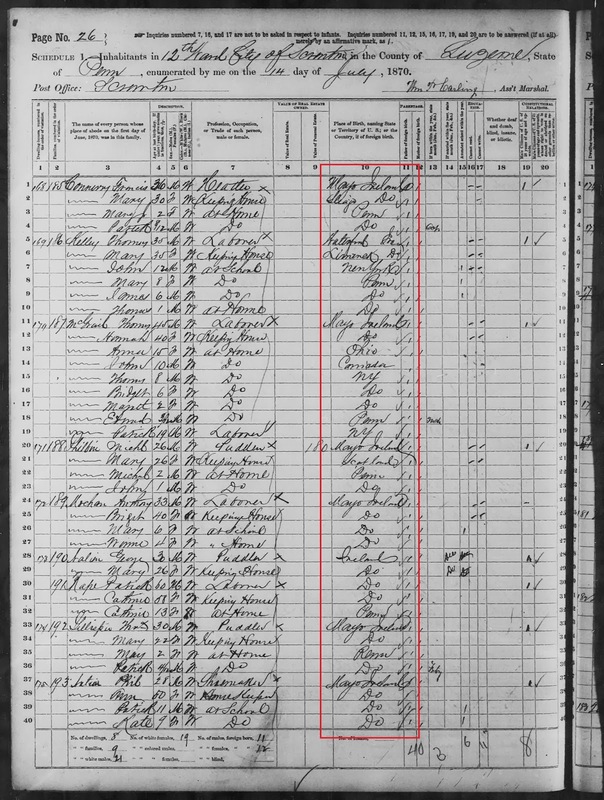 It is important to point out that these examples are a tiny percentage of all the millions of people who were recorded in the federal census as born in Ireland. 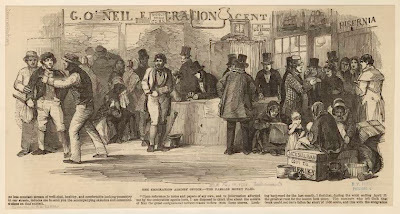 Nevertheless, any record that points to a county of origin for an Irish immigrant is to be welcomed due to how hard it can be to find that information. 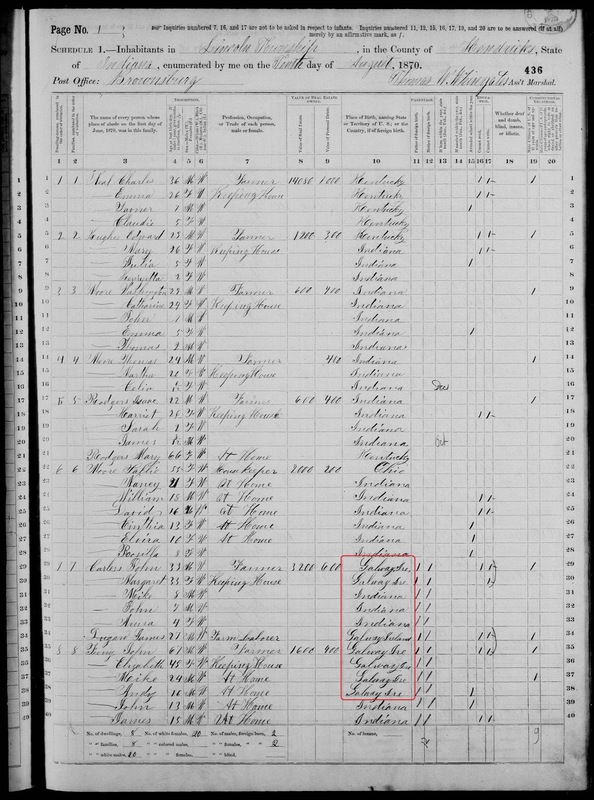 To start off, one of the biggest concentrations is found in the 1870 returns from Ward 12, Scranton, Luzerne county, Pennsylvania. For these records we can be thankful to the census official William Carling. In Ward 12 he enumerated 110 pages of names. For about the first 65 pages he records the county of birth for the majority of Irish immigrants that he enumerates. There is a heavy Mayo concentration throughout these pages, followed by examples from Sligo and Cork. Many other counties such as Meath, Down, and Limerick are also listed. To see all these examples, which total in the hundreds, you can start here on page 1 of the returns from Ward 12 and browse through them by using the image number arrow. The website of the Connecticut State Library has an 'Irish genealogy' tag that displays all their holdings and recommendations for the topic. The interface is somewhat clunky but it is worth persevering with as it provides a very interesting mix of standard genealogy resources from Ireland, such as a link to IrishGenealogy.ie, and Connecticut specific publications, such as Getting Their Share: Irish and Italian immigrants in Hartford, Connecticut, 1850-1940. The Connecticut State Library is located in the state capital, Hartford, at 231 Capital Ave.
You can access the page, here. In internet years the webpage, Prince Edward Island Data Pages – Irish-born in PEI Before 1846, is ancient (created in 1999! ), but that doesn't make the information any less valuable. Margaret Reid has compiled over 1000 names of Irish people who were on Prince Edward Island before the Famine and they include the Irish county where many of them are from. You can access the database here.